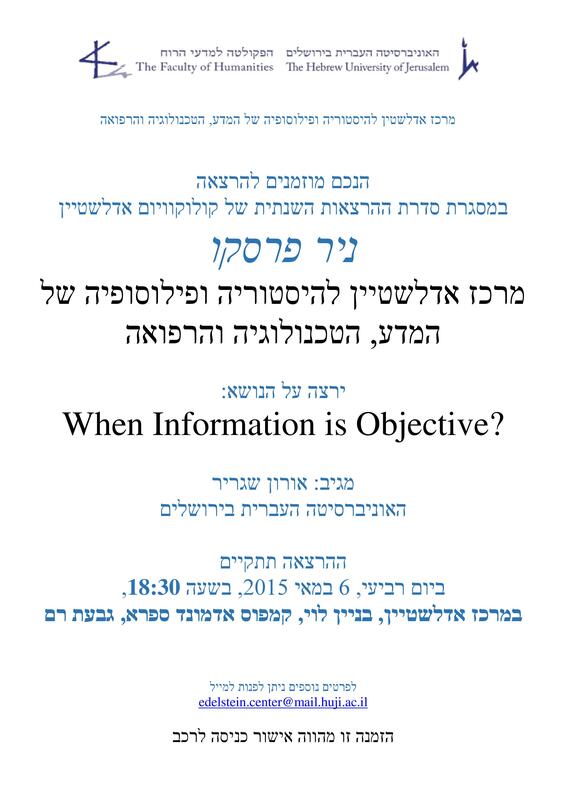 Home › Events › Past Events › Edelstein Colloquium 2015-2016 › Nir Fresco- When is Information Objective? This paper argues that a strict objectivist view of information faces problems in the context of both cognitive science and philosophy of science. It reviews several well-known theories of information and then examines the objectivist and subjectivist views of information, particularly, in relation to understanding cognition. Moreover, taking cue from Popperâ€™s Objective Knowledge (1972), it is argued that the objectivity of â€˜scientificâ€™ information should not be interpreted as being â€˜totally receiver independentâ€™, but rather as â€˜intersubjectiveâ€™ in a Kantian sense. Finally, it is argued that there is a tenable way of construing information such that it enables an explanation of cognition in both humans and nonhuman animals in informational terms whilst yielding to quantificatioalÂ terms.